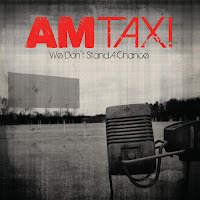 We Don’t Stand A Chance is an energetic release from the Chicago based rockers known as Am Taxi. These boys mix in everything from punk to pop to world beat. Their songs reflect real life situations that fans can relate to. The disc begins with the anthemic “Dead Street” that will have you singing from the get-go. Adam Krier’s distinct raspy vocals add a Brit punk edge, which is fitting for The Replacements inspired “The Mistake”. “Charissa” pays homage to The Clash, and its engaging lyrics makes for a great sing-a-long. “Fed Up” and “Woodpecker” are total high octane tracks that emit a fun upbeat vibe. Am Taxi brings the energy down a notch with “Maydays and Rosaries”. This little ditty features soft female vocals and delicate guitar strumming. “Champagne Toast” is a great heartfelt tune that serves well as a solid closer. All in all, AM Taxi’s We Don’t Stand A Chance is filled with a number of vibrant and upbeat songs that are guaranteed to lift your spirits. It’s just one of those feel good albums that qualifies as a guilty pleasure.